Ayrton Senna de Silva was born on March 21st, 1960 in San Paulo, Brazil. He died May 1st, 1994 at the San Marino GP and remains the last Grand Prix driver to die at the wheel of a Formula 1 car. 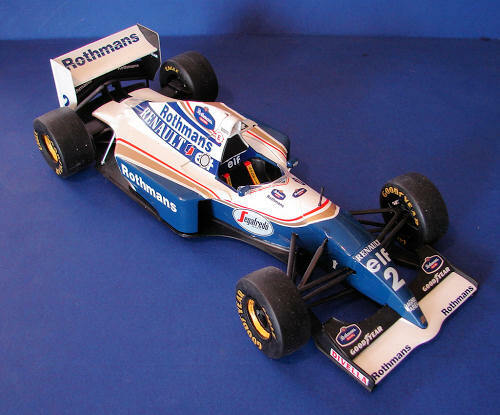 He was in his third race for Williams F1 and was driving the Williams FW16. The Williams FW16 was a passive evolution of the FW15C that had preceded it. It featured revised bodywork, with a low profile engine cover and enclosed driveshafts and an anhedral rear wing lower element, the latter being hinted at in the preceding FW15C. In addition to these changes it featured an innovative rear suspension wishbone design and an improved version of the Renault RS6 3.5L V10. The number 0 car was driven by Damon Hill for the entire season. The number 2 car was driven by Ayrton Senna, David Coulthard and Nigel Mansell. "I have a very negative feeling about driving the car and driving it on the limit and so on. Therefore I didn't have a single run or a single lap that I felt comfortable or reasonably confident." A design flaw was discovered in the car's frontal section before the third race of the season, which was attempted to be remedied for the 1994 San Marino Grand Prix. Various other alterations were made to alleviate the cars handling problems by Adrian Newey and Patrick Head. However the car was springy and unstable, with aerodynamic deficiencies which the revolutionary rear suspension could not mask. 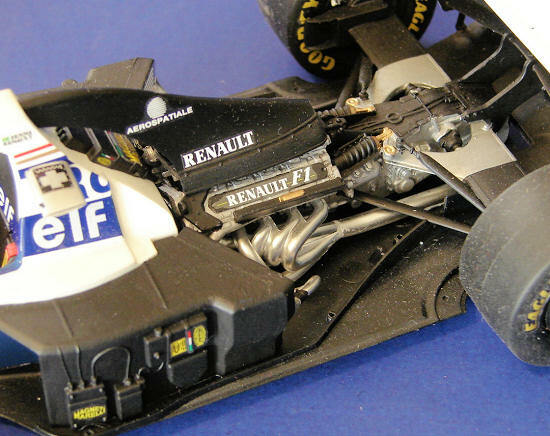 The FW16 lacked the active suspension and traction control of the previous season's FW15C and suffered from a very narrow driveability setup window that made it difficult to drive until the modifications to become the FW16B. The first comprehensive set of modifications to widen this driveability window were introduced at Imola. These included a revised nose profile with the wings positioned slightly higher, new aerodynamic end plates which were slightly taller, a revised wheelbase and a re-shaped cockpit surround. Other cockpit changes were designed to accommo date Senna's desire to be made more comfortable in the car and included changes to the steering column design to adjust the steering wheel position in line with Senna's personal preference. Patrick Head subsequently also removed a section of the chassis to give Senna more space. Following the Imola changes the car was again incrementally updated and was labeled as the FW16B by the German Grand Prix. This version featured a longer wheelbase, revised front and rear wing, shortened sidepods and the compulsory opened rear on the airbox and cowling in accordance with FIA regulations following the accidents at Imola. The shortened sidepods arose due to a necessity to use larger barge boards after the front wing endplate diffusers were banned. Hill battled Schumacher for the championship but lost by a single point in the final race in Australia, but Hill's hard work meant that Williams won the constructors' championship that season. 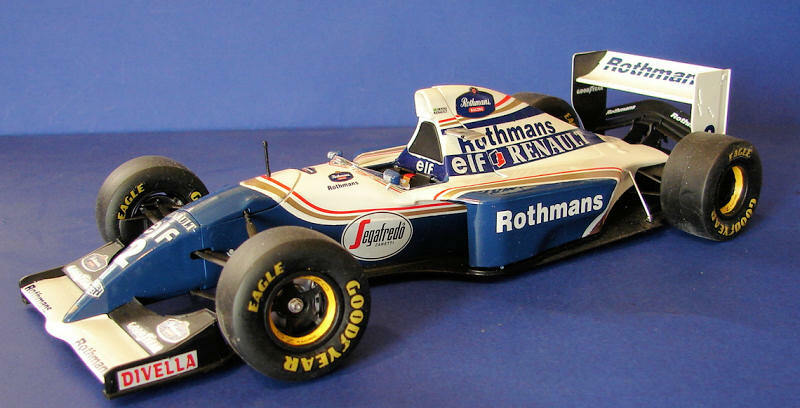 The Williams FW16 is considered by many in Formula 1 as a failure, but it is remembered by most F1 fans as the car that carried Ayrton Senna to his death. The death of Senna, considered by many to be the greatest driver of the modern F1 era, rocked Formula 1 to the core. Many safety improvements were made in the sport following Senna and Roland Ratzenberger's (who died the same weekend as Senna) deaths. These include improved crash barriers, redesigned tracks and tyre barriers, higher crash safety standards, and higher sills on the driver cockpit. The circuit at Imola was redesigned to eliminate the Tamburello corner where Senna crashed. The legacy of Senna is such, that every Williams Formula 1 car since has carried the "Double S" crest of Senna somewhere on it's bodywork. The kit is molded in white, black and "aluminum" plated parts. Rubber tires are also included as well as plastic inserts to hold the wheels on. A small p/e fret contains seat belt hardware. Decals are nicely done but do not include the "Rothmans" markings. The instructions are nicely printed but are only in Japanese, so I can only guess at what some of the build notes say. Only Gunze colors are given and a couple will have to be mixed. One of the colors to mix is, I think, Semi-Gloss Black for the suspension parts. Not sure why Fujimi did it that way, as Semi-Gloss Black is readily available. I started by gluing the chassis halves together. You will need to remove one of the lips on the inner side that hold the seat in place so you can slide the seat inside after painting. I then attached the front bulkhead, front upper suspension arms and nose onto the body. This makes painting the chassis WAY easier as I didn't want the nose removable anyway. I filled the resulting seams and set the chassis aside. The engine is pretty straightforward. The only part I deviated on was the fitting of the air intake. I added that after fitting the engine to the body. The rear wing will require a bit of modification as the upper insert appears to be to wide. I had to trim it a bit so the lower inserts would fit properly. After decaling, the rest of the front suspension was attached. The suspension was then painted as an assembly. I feel this is a better way to do it so you don't risk breaking off parts during the decal process. The body and engine were then mounted on the lower pan. Fit the body first, then the engine. Once they are dry, attach the air intake for the engine. The last bits fitted were the windscreen, mirrors, rear wing and tires. Fujimi uses a clear insert to hold the tires onto the chassis. They don't seem to work near as well as the black ones Tamiya uses. I hard a really hard time getting the tires on and the left front tire is still a bit loose. I used Tamiya TS-26 for the white. The instructions provide a mixture for the "Rothmans" blue, but I chose to use Tamiya TS-15 for the blue. It doesn't quite match the decals, but it is very close and only noticeable when compared to the blue cowl stripe. After s praying the white, I attached the provided paint masks and sprayed the blue. Now, these paint masks are a story in themselves. They are NOT precut, so care is needed when cutting them out. The big problem is that after removing them and applying the decals, I found that the cowl masks do not match the outline of the gold/red/white stripe. It's possible that I may have installed them wrong, but the mask for the body matched the outline just fine. As a result, a bit of touchup was required on the cowl sections. If I could do it again, I would not use the masks and just tape off the area using the decals as a guide. I don't understand why Fujimi would plate parts in that beautiful aluminum plating and then tell you to paint the parts black. The removed the plating from the suspension spindles and brake cooling ducts before painting them flat black. The engine was painted, as an assembly, aluminum with a flat black gear box. I painted all the suspension parts flat black. The front wing is suppose to be Satin Black, but I chose to paint it flat black. The rear wing was assembled, painted gloss white and then the lower wing and inside were brush painted flat black. The decals are nicely done and look quite nice. However, the first decal I tried to install, splintered. There have been stories that this has happened to others, so I believe it is not just the decals in my kit. I coated the rest of the decals with Testors decal sealer and had no further problems. The decals turned out to be very fragile, so care much be used when placing them on the body. Even after drying, several of them chipped and needed to be touched up. There is a white stripe between the blue and the gold. I find it odd that Fujimi included this on the cowl decals but not on the chassis decal. Make sure to leave a bit of white showing when installing the chassis decal. The red/gold stripes also appear to be too wide. Even the picture on the box shows that the stripes should be much narrower. On the right side of the cowl is a refueling point. Because of this, the "Renault/Elf" script on the right side of the cowl was smaller to allow it to fit without covering the port. Fujimi made both left and right the same so the "Elf" portion covers the refueling port. Also the "Segafredo" decals on the sides of the nose are WAY too big. They should be completely on the blue but end up covering most of the stripe as well. I have never had much luck with the yellow decals for the wheels. I tried to use them but ended up painting the yellow on the wheels. The tire logos went on with no trouble. The TABU decals were a very nice addition to this kit. I had no trouble with them and they fit perfectly. I believe the sheet is actually for the FW-16b, as the only driver decal on the sheet is for Nigel Mansell. There is also a red #2 and some extra "Rothmans" scripts that were only used on the FW-16b. However, there are enough decals to do the FW-16, even a few left over in case of mistakes. It's a shame there are not enough of the large "Rothmans" logos to do another car. 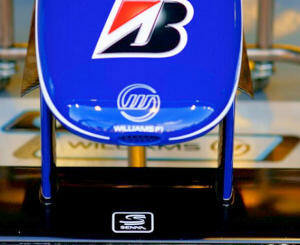 Interestingly, TABU also includes two of the Senna "Double S" logos that were added to the cars after Senna's death. Good research will be needed to use the TABU decals as they don't come with a placement sheet. I was surprised how few GOOD photos there are of Senna's FW-16 in race trim. There are a few, but it's hard to find photos that show the placement of certain decals. Just make sure you don't mistakenly use photos of a FW-16b. You can tell the difference by the 16b's shorter side pods and added barge boards. A very nice kit. The rear cowl doesn't fit to the chassis very well, but other then that, it has few fit problems. A bit of English translation in the instructions would have been helpful. The decals are a bit of a letdown, but it can be built up very nicely even without the added "Rothmans" decals. 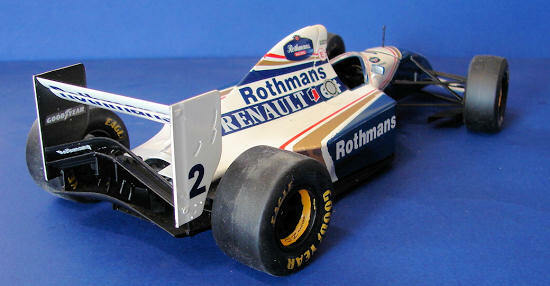 I have included a few photos that will help in the placement if the "Rothmans" decals, if you chose to add them. Note, however, that the left side view is of an early version of the FW-16 with the double wing. Because of the decals and paint job, I can't recommend this kit for someone new to F1 cars, but someone with a few builds under their belt should be able to handle it with little trouble. My thanks to Hobby Link Japan (via your editor) for the kit and for the decals. Thanks to If you would like your product reviewed fairly and quickly, please contact me or see other details in the Note to Contributors.